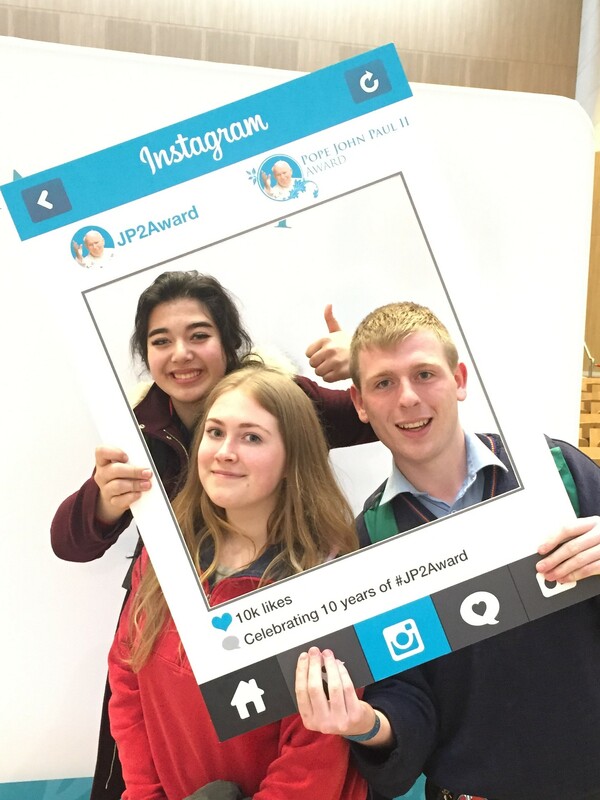 On Wednesday, 5th April 2017, over 1,000 young people, who are currently participating or have received the Pope John Paul II Award in the last 10 years, gathered at Knock Shrine to celebrate the 10th Anniversary of the Award. Among that group were 155 young people and 15 Award Leaders from Kildare and Leighlin who rose early on Wednesday morning to travel the journey to Knock Shrine in Co. Mayo. When the Award was launched in Derry in 2006 by the Papal Nuncio, Archbishop Lazarotto, it was never imagined that the Award would spread beyond the diocese. It has now been introduced into 22 dioceses in Ireland and 2 in Britain – the Archdiocese of Birmingham and the Diocese of Hexham and Newcastle. In the last ten years, over 20,000 young people have enrolled in the Award over 2,000 of whom have come from our diocese alone. It was acknowledged recently, that the Pope John Paul II Award is the largest youth movement in the Church in Ireland today. The ceremony started at 11:00am with the welcome liturgy. Pope John Paul II Award participants from each diocese had a role to play in each of the day. Aoife Whelan form Graiguecullen/Killeshin parish had the opportunity to share her experience of participating in the Pope John Paul II Award to date. At 12 noon, the crowd paused for the Angelus. Afterwards they listened to inspirational talks by the guest speakers and partake in a short Q & A on what the Award means to them. After lunch, the crowd gathered at the Apparition Chapel to listen to a history of Knock. It was followed by a decade of the Glorious Mysteries of the Rosary led by Deacon Gary Moore form Rhode parish and finished with a moving rendition of Our Lady of Knock by soloist Anne Marie Hickey, Diocese of Derry. The day provided young people from different dioceses with the opportunity to share their experiences of participating in the Pope John Paul II Award, discuss how it impacts on their faith and recognises the special place they have in the Church. They had time to pray together, to listen to an inspirational talk by Elma Walsh, mother of Donal Walsh and to celebrate the Eucharist. Music was provided by Elation Ministries, choirs from participating dioceses with there was a special performance from singer/songwriter Niamh McGlinchey, a former recipient of the Award. Chief celebrant was Bishop Donal McKeown, Bishop of Derry, Patron of the Award. He was joined by several priests from participating dioceses including Fr. Paddy Byrne from Portlaoise parish and Deacon Gary Moore from Rhode parish. The day was a fantastic celebration of youth. Our young people from Kildare & Leighlin got a true sense of the essence of this award and just how much it can impact their life and the lives of others. Our group of 170 represented our diocese so well, various dioceses commented on the enthusiasm, energy and excitement of the Kildare & Leighlin throughout the day – they certainly did us proud!